"I won't stop honoring veterans until I can't bend down anymore." My VisionHonor Veterans Across The Country. With your help, we can honor Veterans across the country everyday, not just on a holiday and bring awareness and prevention to veteran suicide. Your contributions help me deliver to this worthy cause. I need your help. My Mission StatementHonor Veterans everyday, not just the holiday. Veterans fought for our freedoms and risked their lives whether or not we realized it or appreciated it. 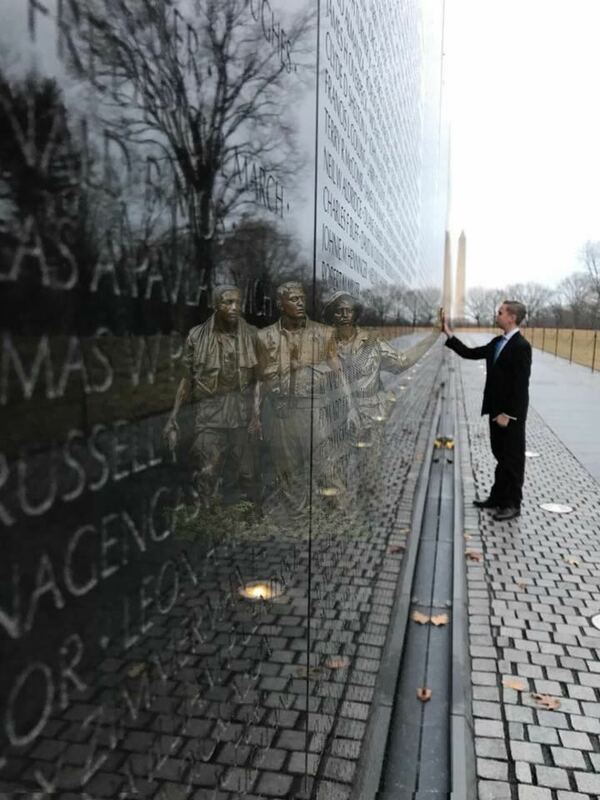 Without the services of our veterans, we would not have the freedoms we do today. Veterans have served all of us. This is why I have made it my mission to Honor Veterans everyday, not just the holiday. Please join me in honoring our Veterans. 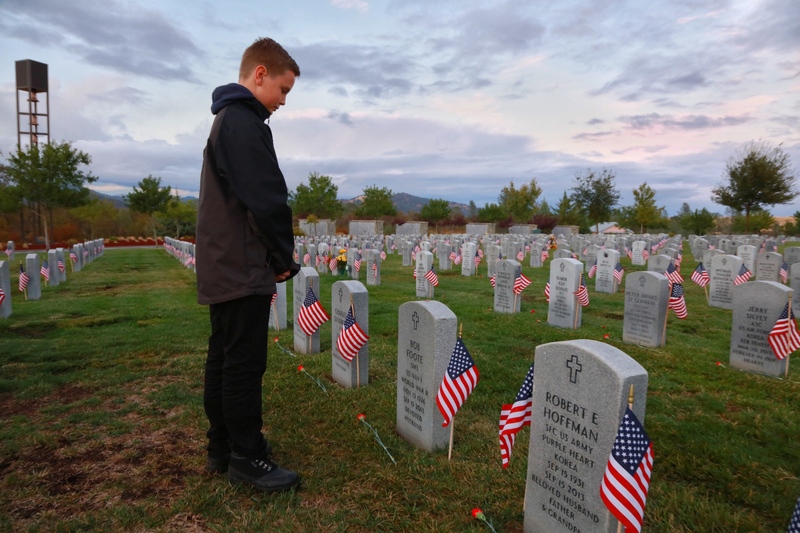 On Veterans Day 2015, Preston visited the grave of his grandfather at a Redding cemetery to place a flag and some flowers. 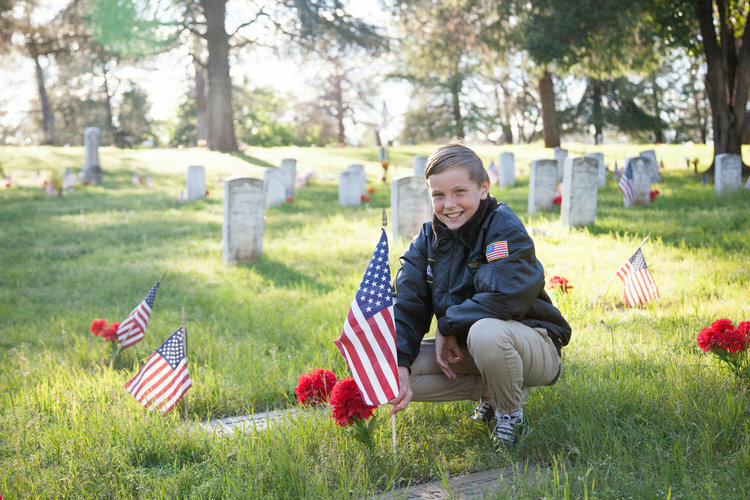 The then 10-year-old Preston Sharp noticed the lack of flags or flowers on the graves to honor local veterans. He was so upset that veterans weren’t being honored on Veterans Day. I told Preston “You can’t complain about something unless you are willing to fix it”. Preston looked up at me and with a very strong voice said: “I am going to do something about it!”. He started raising money for the flags and flowers immediately by asked how much money he could get if he vacuumed the floors. 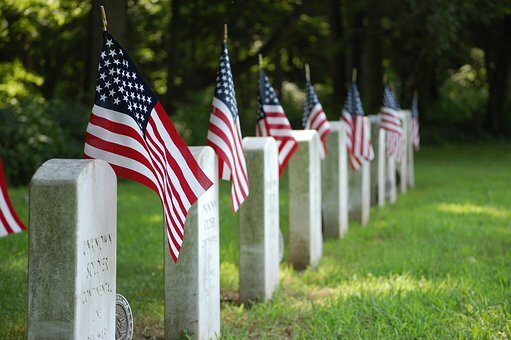 That night, Preston set a goal to place a flag and flower on the graves of each of those veterans at McDonald’s cemetery, in Redding CA but that goal quickly grew to include other Redding area cemeteries and grew to include cemeteries in all surrounding counties. Every time I told Preston that there was no more money for the flags and artificial carnations, he told me not to worry and to schedule him to talk in front of a group. Preston made a goal of Honoring every towns veteran’s from Redding to Sacramento CA, this goal was accomplished last summer. Preston came up with the Flag and Flower Challenge to get everyone in the US to honor veterans. Preston has now expanded his goal to honor veterans in every state. 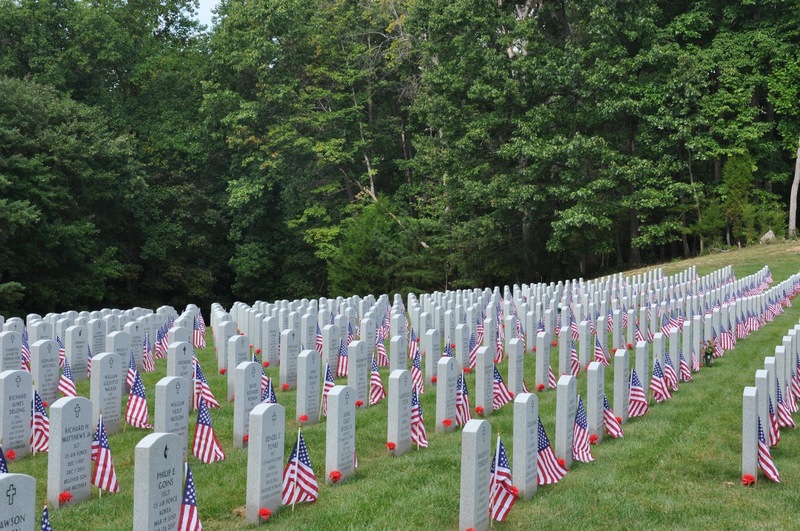 Preston has organized the placement of more than 180,000 flags and red carnations on veterans headstones. He has accomplished this with the assistance of many in the community who come out to meet him and to clean headstones, replace weathered flags and flowers and say “Thank You” to those that have provided their services to our country. If you come out and help Preston Sharp you have to say the veterans name out loud and then thank you for your service, place the national flag and an artificial red carnation. He says that you have to say the veterans name out loud because a veterans name not said out loud is a veteran forgotten. Preston does not just honor the fallen veterans. He goes to the local veterans home and listens to their stories. Takes veterans out to lunch or dinner. Preston even told his mom that his Christmas wish was not to get the laptop that he had been asking for but to adopt a veteran’s dog so that the veteran could still see the dog whenever he wanted. The veteran had to live in a veterans home with no dogs allowed. 18-22 veterans die by suicide every day. There is a real need to help increase the prevention and awareness of veterans suicide. I need your help. Get involved with the movement today. 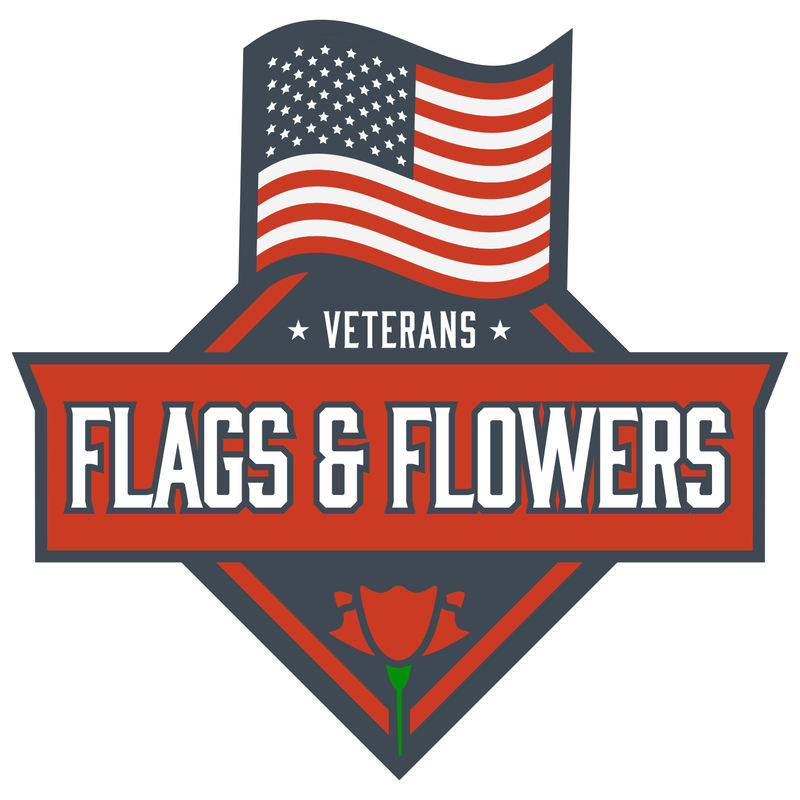 Sponsor a flag & Flower today!